" I am so excited to have found a company that provides such a wide selection of quality clean inspirational VHS and DVD products." Christmas Mountain: The Story Of A Cowboy Angel classically captures the timeless magic and spirit of Christmas. A heartwarming Christmas tale featuring American leading man Mark Miller Writer, Producer and star of Savannah Smiles and his boisterous comic-sidekick, the immortal, eternally lovable, Slim Pickens. Imprisoned, down-on-his-luck drifter, Gabe Sweet (Mark Miller) is forced to seek redemption by undertaking a Christmas charity mission on behalf of the town. There's only one problem - the "charity" is as empty as the hearts of the townspeople themselves. But, with the help of a dearly-departed Angel wannabe (Slim Pickens), Gabe quickly learns that the ones truly in need are the ones who already have the most. 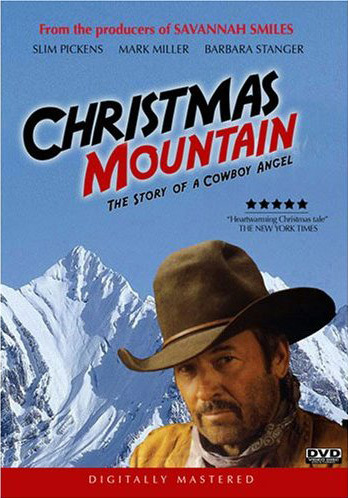 Christmas Mountain: The Story Of A Cowboy Angel classically captures the timeless magic and spirit of Christmas. In the vein of Miracle on 34th Street and It's a Wonderful Life, join Gabe on his journey of friendship, compassion and understanding and learn what it means to be truly rich ... in spirit. Format: DVD Region 0 - Digitally Mastered What's a Region Code? How can a young girl bring the holiday spirit to a town that has never heard of Christmas? Teaching children Christian value’s through entertaining animated cartoons. Are wishes coming true because of an angel living in the old abandoned house? An Angel Band Christmas showcases a beautiful collection of both beloved and new Christmas songs. Christmas Mountain: The Story of a Cowboy Angel, is a fine film, though it does tend to extol the virtue of "works" being the road to Salvation. Please overlook the "works" and enjoy!